No one sets out to live a cluttered life. It just sort of…happens. A family moves into a new home, unpacks their things, and there’s initially a satisfying degree of order and tidiness within their surroundings. The slow creep of clutter eventually works its dastardly magic, however. That once-organized abode gradually morphs into a messy, stress-causing space that becomes increasingly difficult to function in. The reasons for a home’s descent into a disorganized, clutter-filled state are many. One of the main culprits is a lack of time invested in home cleaning and organizing. This may be due to having a cluttered life in other ways, such as being consumed by work responsibilities. Or maybe it’s more about priorities. A 2015 study by Moen (North America’s top faucet brand) found that almost 20% of respondents didn’t prioritize keeping their home organized. Anyone looking in at your life from the outside can make a few assumptions about how your cluttered life is affecting you. Here are five examples. The most serious way in which living with too much clutter affects us is the toll it takes on our health. Anxiety and stress are unfortunate by-products of living with a lot of clutter. Even if you don’t think your clutter is stressing you out, your subconscious self might disagree. Whether you’re aware of it or not, the brain interprets one’s messy surroundings as something that needs to be dealt with. Clutter also impedes our ability to focus on things. For those more troubled by the cluttered state of their home, the stress can become to feel inescapable, energy-draining, and even lead to depression. A Huffington Post survey found that the fifth most common stress trigger for Americans was worrying their home wasn’t clean or organized enough. Whichever camp you fall into, the conscious and subconscious stress your cluttered life is causing is also probably affecting the quality of your sleep. Naturally, poor sleeping habits can contribute to other health problems. A cause and effect of clutter-related stress may also involve a decline in your self-esteem level. Depression and low self-esteem go hand in hand. In homes where clutter problems have become particularly debilitating, the mere thought of how to address the issue can become overwhelming. Letting the problem escalate to a seemingly unmanageable level can lead you to feel ashamed and guilty for not being more in control of the situation. With a messy home, you’ll be less inclined to entertain guests. Even just letting visitors into your front doorway might not be something you’re willing to do if the clutter problem is completely out of control. After all, who wants a visitor to leave with a bad impression of your home and you after getting a glimpse into your cluttered life? Adding two or more people to a living situation can lead to friction in the home over how much effort others spend on keeping the space tidy. It’s almost inevitable there’ll be a butting of heads at some point over this issue. That aforementioned Moen study stat about 20% of respondents not prioritizing home organization undoubtedly has ripple effects. For those who consider themselves to be the most organized person in the home, the indifference of other occupants towards keeping their shared space clean is viewed very unfavourably. Animosity grows and relationships can deteriorate. 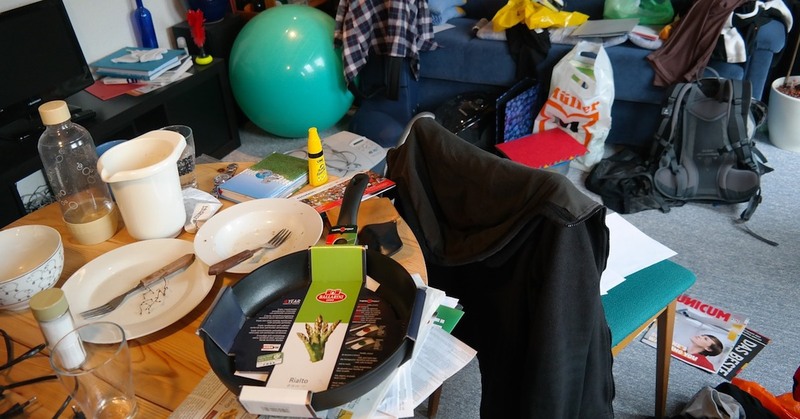 Even if an exasperated neatnik does make an effort to clean up someone else’s space, they might alienate the messy person by throwing something out that should have been kept. And how many times have we heard about someone being annoyed that they can’t find anything after someone straightens up for them? Clutter doesn’t just have a mental and emotional cost, there’s an actual financial cost you need to consider. Organization expert Peter Walsh examined this in his book Lighten Up: Love What You Have, Have What You Need, Be Happier with Less. Walsh lays out a scenario to illustrate his point about how much money is wasted in home square footage with clutter. His example takes a $250,000 home (clearly, he doesn’t live in Toronto or Vancouver) that has 2,500 square feet. It’s easy enough to determine that one square foot in the home is worth $100. Now consider, how many square feet are wasted in the average home with useless clutter? The literal cost of clutter can add up quickly. Clutter’s effect on your health and finances is sobering enough. You also can’t ignore the toll that clutter takes on your time and productivity at home. Trying to find things in a disorganized home can consume a ridiculous amount of your time. A 2017 survey by Pixie (who make an iPhone app that helps you find lost items) found that the average American wastes 2.5 days each year searching for things at home. That Esure Home Insurance survey produced similar results. It estimates Britons spend about 10 minutes each day looking for misplaced items. That works out to a little under 2.5 days each year. In addition to the wasted time spent looking for things, a cluttered home also limits your ability to be as productive as you should be at home. For example, a chore like vacuuming takes more work because there’s clutter you need to navigate around. Maybe working out on your treadmill is less likely to happen because you’d have to clear off all the clothes that are draped over the machine. For help when it comes to dealing with your cluttered life, Organized Interiors has the know-how and right products to restore order to your home’s organization. Schedule your free in-home design consultation with us today.